Neil Lennon says he should escape punishment for his on-pitch celebration after seeing his side seal a 5-5 draw against Rangers after accusing the Rangers support of targeting him with sectarian. The Northern Irishman darted onto the Leith pitch after seeing Jamie Maclaren levelled up an incredible affair in stoppage time. “Well they make it personal don’t they?,” he said. “You all hear it. “They are singing sectarian songs at me. It’s just a little bit of ‘have some of that’. “It was worth it. Trust me. Bobby was fine about it. I should not get a ban for that. I was just letting them know how pleased I was to get the equaliser. 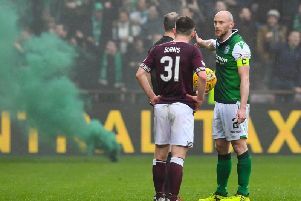 The build-up to the last-day clash had been dominated by Lennon’s threat to quit his job following Hibs’ midweek defeat to Hearts. But the former Celtic boss admitted he had “spat the dummy” after that derby defeat before reiterating his commitment to the Leith cause. Speaking after seeing his side end the campaign in fourth spot, he said: “There has been speculation, but I caused the speculation. There’s no issue with the board. “I wanted to break into that bracket of Aberdeen and Rangers and we have come up short. Lennon’s summery of the action as “absolutely bonkers” just about summed up as astonishing game. However, another Maclaren goal sent Gers’ nerves jangling and with Jimmy Nicholl’s men down to 10 after seeing Holt sent-off late on, Hibs’ on-loan Darmstadt frontman prodded home at the death to the delight of his manager. Gers had to better Aberdeen’s result at Celtic Park to claim second spot but it is the Dons who finish runners-up after a 1-0 win in Glasgow. He said: “All in all, all I can say is that it has been an eventful three games. “They have shown a bit of character, a bit of ability as well, over the season and it depends on who is going to stay and who is not going to stay.